My mother-in-law brought over a photo collage for my birthday last week featuring old photos from our homestead – before it was a homestead. Bare grass and gently rolling terrain was all there was to see. It was quite a reminder about how much things have changed around here. I thought you all might enjoy a little peek into how things have changed over the years. Our place will never be quite like grandma's homestead, but we've made a pretty nice oasis of growing things here. 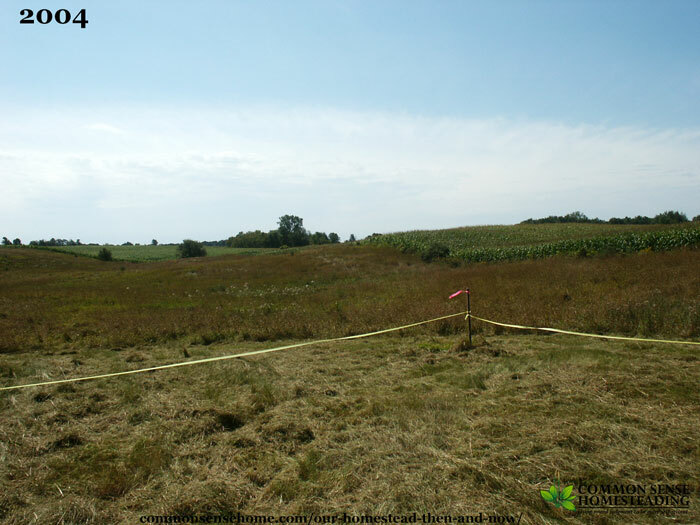 The land we found for our homestead was 35 acres of farmland that was being sold separately from the original farm. 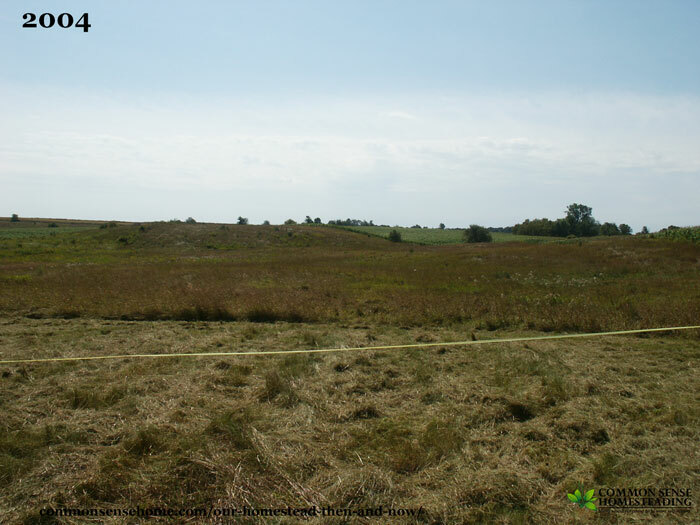 25 acres was in production, being farmed by another neighbor, with 10 acres of abandoned pasture that was landlocked behind the original farmstead. 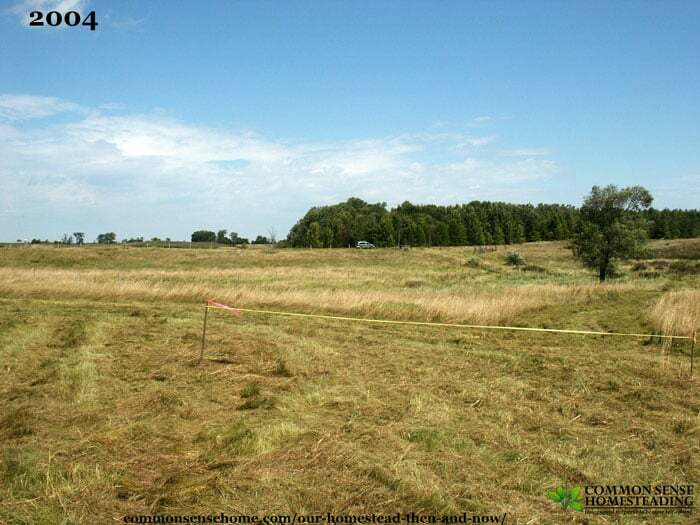 We swapped a strip of land with the neighbor who bought the original farmstead so we could put a driveway in. The first path to the house was cut through the overgrown pasture but the neighbor who agreed to swap the land. He's a hard working young man. He bought the old farmstead not long before we bought the raw land, before he turned 21. To get our driveway in, he had to pull and move the line of fence posts he had only recently put in. As it turns out, the swap worked well for him long term, too, because he used the land that we swapped him to put in a large machine shed. We also agreed to a variance for his shed because it was fairly close to the lot line. Good neighbors are worth their weight in gold. The original access path, circa 2004, with our van parked out on the road. The driveway circa July 2017. We had the contractor put a loop in so we could turn around larger vehicles and heavy equipment, and it's worked out well. Over the years I've tried planting flowers in the center of the driveway, but only the strong survive. (It's a high wind spot.) 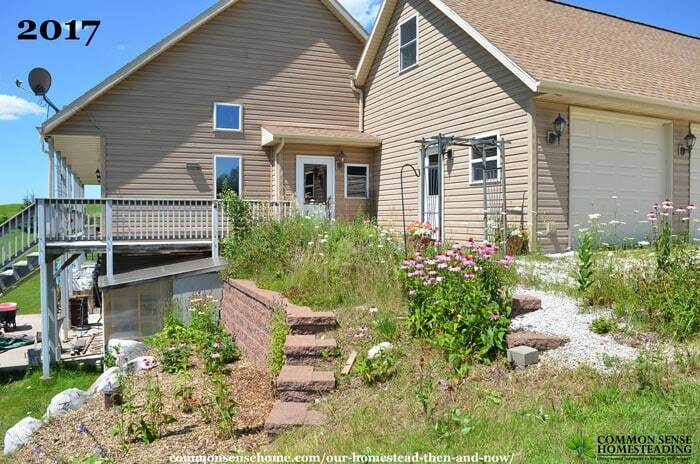 There's a big garden bed to the left of the photo, north of the house. You can see the white and purple lilac trees at left center of the photo, which were a gift from another neighbor. To the south of the house, away from the road, the biggest transformation has taken place. Since most of the windows face that direction because of the passive solar aspect of the house, we wanted a nice view. It's also more protected there, by the house, and the treeline, the outbuilding placement and now the pond. Facing due south, roughly in the area of the house, circa 2004. Not much to see except grass. View from our south facing deck, circa 2017. There's the main wheel garden, plus seven rectangular garden beds. At left center, there's asparagus and peonies, then a patch of red raspberries, and finally sunchokes and strawberries. To the right rear of the photo, there's a small orchard/nuttery that is still quite young, with apples, pawpaws, bush cherries, a butternut, chestnuts, rugosa roses and autumnberries. Between the gardens and the pond, there's a kiwi trellis with boy and girl hardy kiwi plants. At the upper left of the photo, you can see the new pond, which will help moderate the temperature in the immediate area. We left the back hill to grow up with autumnberry shrubs, and have added some maple and birch trees just this year. It's tough to get new plants established because of the deer. A friend told me that mark Shepard of Restoration Agriculture uses willow corridors to funnel the deer away from his orchard, so after the final pond work is done, willows are next on the planting list. Unfortunately there was a miscalculation by the pond builder and the pond is not as deep as it needs to be to support panfish, so we're working on finding a solution. Obviously we didn't have any outbuildings to start, but we identified the area to the west of the main gardens as a good spot to build. It was close enough to the house that we'd have ready access, but not directly upwind in case the critters get messy. Most of our winds come out of the west, so it also protects the main gardens. 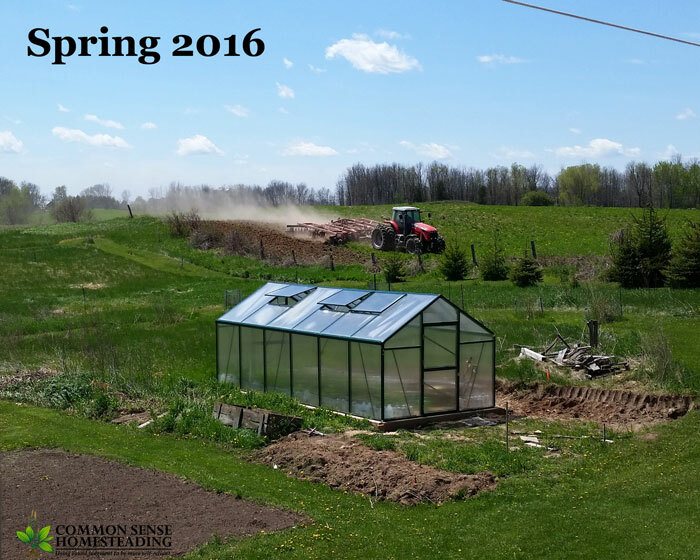 We added the greenhouse in 2015, and the connected coop/garden shed in 2016-2017. The building was all done by family and friends, mostly on weekends, so it took a while. We had to cut into the hillside a fair amount to get the space needed for the foundation and proper drainage away from the building. A retaining wall is in the plans for this fall where the raw dirt is at the corner of the building. The yellow raspberry patch is between the building and the treeline. There's a shade cloth over the greenhouse to keep it from overheating. The baby chicks and ducklings are hanging out at the near end of the building, which is the coop. They're be ready to graduate outside soon. The first evergreen trees we planted over 15 feet tall. This year we put in another 25 trees to extend the windbreak farther south. A different neighbor is farming the field, a dairy farmer with Organic Valley. 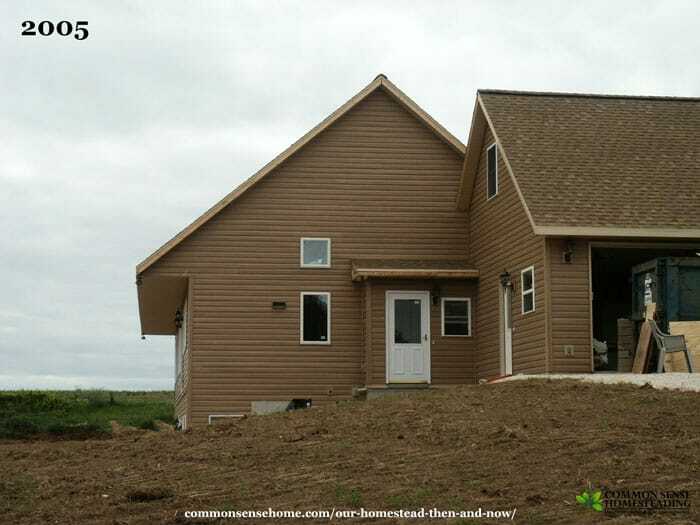 The house looked pretty raw and rough when primary construction officially wrapped up – no deck, no greenhouse, no slab, no retaining walls near the front door. Some things we finished ourselves, like the deck. Others we contracted out, like the concrete work. Now it's a whole lot greener and a whole lot busier. At right, although it's hidden behind the pole beans, the attached greenhouse is finished. There are also two retaining walls to keep the hill in place. We have a stash of wood under the deck. The deck itself runs the whole length of the house, with stairs at each end and wrap around access from the front door. Just out of frame to the left are the solar water heating panels. The front door looks a bit more welcoming. 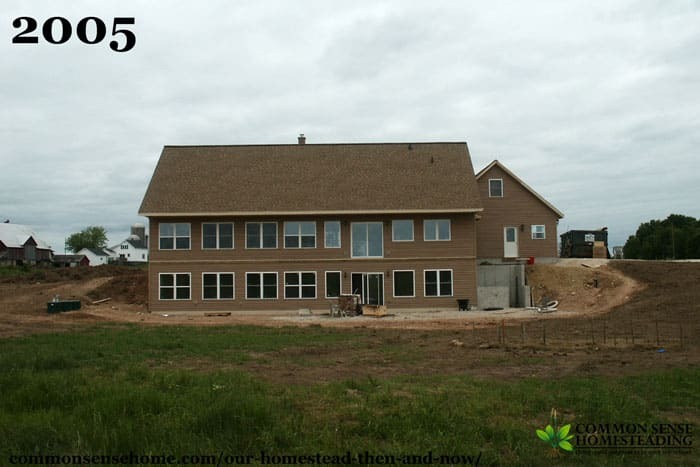 Our homestead, like our needs and dreams, is always evolving. Long term we're looking at teaching classes and diversified income from value added specialty products. Maybe northern kiwi jam will turn out to be a hit, or seaberry sauce, or organic Siberian pea shrub chicken feed? 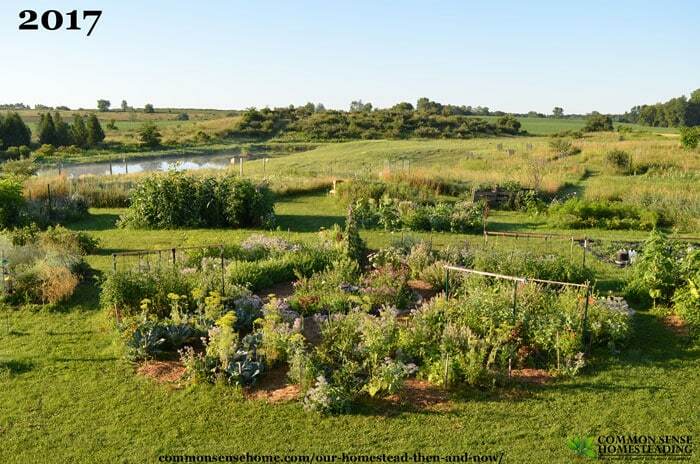 (There are other planting areas around the homestead that I didn't cover in this post. 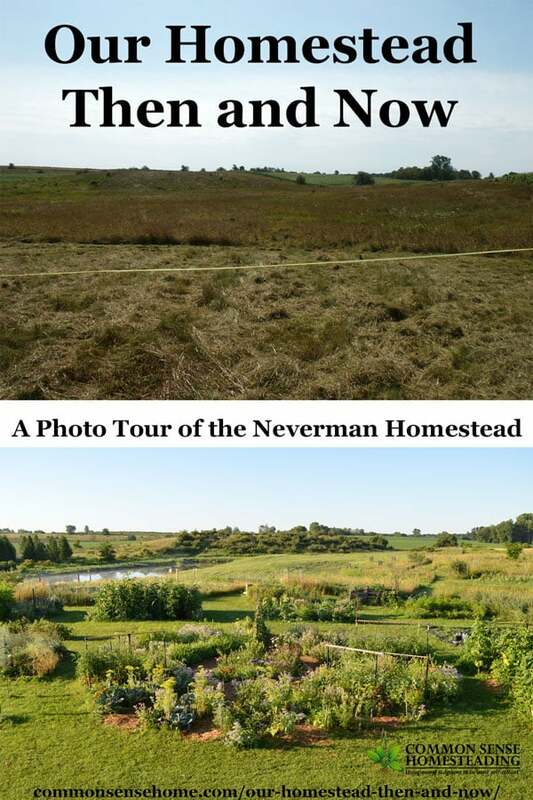 You can see a full site overview in the post The Homestead Permaculture Project. We're not sure if the boys will stay on site, or other friends or family will join us. The only thing I know for sure is that there will always be plenty to keep us busy, and I hope to keep sharing snippets of our projects online for many years to come. 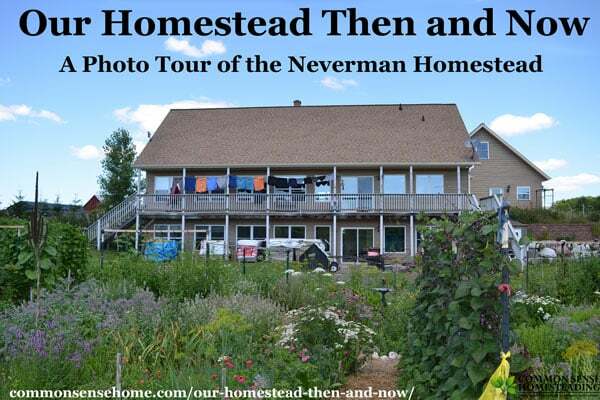 How have your homestead and homesteading dreams changed over the years? Leave a comment and share your story. I do love to see people taking vacant or neglected areas and reviving them to production and life, especially the way you and yours have done. Buying farmland is a good way to go, We bought heavily wooded (planted pines from 75-85 years is my guess) and began our journey. I love that you are hanging your laundry on the porches in full sun. (envious) The gardens and pastures and production areas are looking great. It is impressive that you have taken negative or difficult things and made them work in wonderful ways. Makes me wish I had been more aware of the changes and improvements we have made. You should be pleased and proud. Its a lot of work! YA DID GOOD! Thank you, Diane, and I bet your place is something to see, too, with all those years of work you’ve put into it. Laurie, this is beautiful and most inspiring! Thank you for sharing the photos and giving the context so readers can truly appreciate all that you’ve done. I’m glad you enjoyed it. I wasn’t sure if it would be interesting to anyone other than us. I really enjoyed reading this, thank you for sharing . You and your family are amazing ,keep up.the good work ! Glad you enjoyed it, Angela, and thank you for your kind words. Wow, you’ve done such a lot of work from a blank canvas. Sometimes it can be hard to envisage what it will look like. It looks beautiful. Thank you, Jackie. We’ve tried to learn the site and work with it as best we can (building the house into a slight rise, placing the pond in a wet area, etc.). Congratulations. 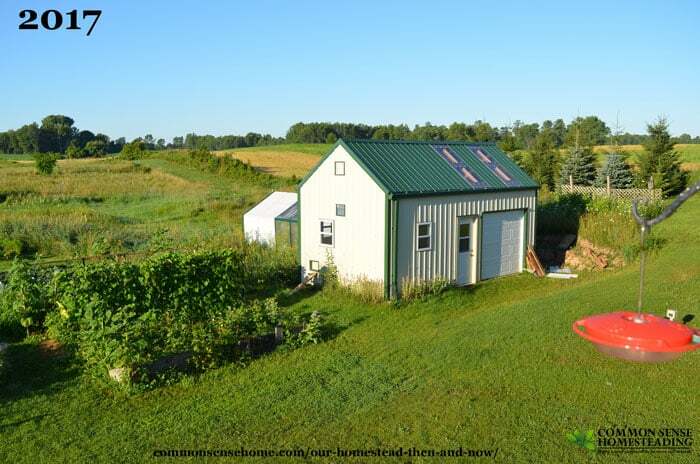 It’s really inspiring what you have done on your homestead. It’s so easy to get impatient and want it all now, but learning to enjoy the journey and the fruits of your labour is a wonderful thing. I spent a number of years living in Australia on a 4/5 acre mini homestead. Lots of successes, plenty of failures (or valuable lessons, however you want to look at it) and really enjoyed it. I’m back in sunny England, on a much smaller property, but still living the homesteading lifestyle. I’m so passionate about it all, sustainability, permaculture, reducing waste etc, I started a new blog of my own. Hopefully in a few years it will be as wonderful as yours. 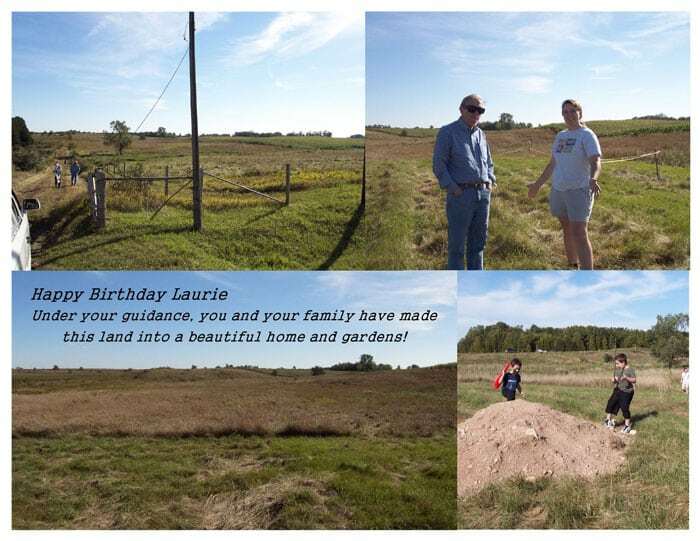 Laurie, thank you for sharing your beautiful journey. I love your vision and how hard you have worked as a family to create such a wonderful place to live and I would imagine the memories as depth and insight. I love looking at the pictures you send, seeing and reading about your experiences. Wishing you well and many blessings! I make your sandwich bread recipe all the time, but I have substituted natural starter for the yeast and it works beautifully. Thank you for your kind words, Marsha, and I’m glad you enjoy the bread recipe. I always wonder about how much of what to share, and whether anyone is interested. After all, we’re just here doing our thing as best as we are able. We’re not famous or flashy. 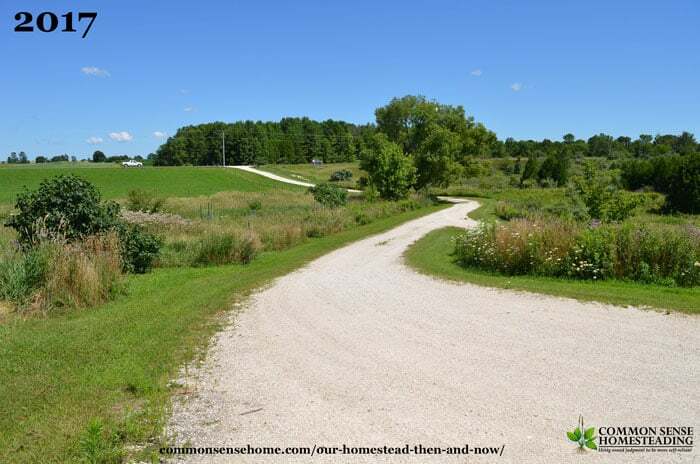 Laurie – thank you for sharing your ongoing homesteading story. I enjoy your daily posts on Facebook. The added adventures of “the duckies” is a daily enjoyment. Your mother-in law Jane and I are old childhood friends . We remain in touch after all these years. (Even though not as much as I would like ). Thank you again. Thank you for stopping by, Jane. Jane has mentioned you fondly over the years.